If you don’t have a tent or are not interested in setting up camp, but would like to be in the beautiful outdoors than Colorado has lots of great options! 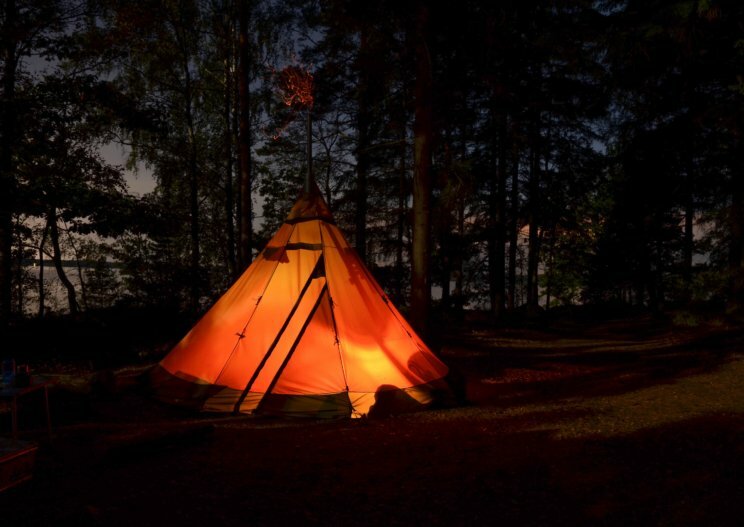 Check out these yurts, tipi’s, and treehouses for rent. Lots of accommodations and less-stress camping! Take the family, a special someone, or a group of pals out into the mountains to go hiking and swimming. In the evening, retreat to a cozy space and play board games or card games in the light of a lantern. This is a great time to bond, teach the games you played as a child to your children or friends, tell jokes and ghost stories. Bring along an instrument and start up the family band you always wanted, plus you can spend time making up good names for this imaginary band. EPIC TENT-FREE CAMPING IN COLORADO! Rocky Mountain Treehouse is a definite upgrade from the treehouse you built when you were twelve. This one has a wood burning stove, view of the stars and a hot tub. It can fit six guests so it could be a great retreat for your family or friends. There are full amenities here as well as a rock shower. 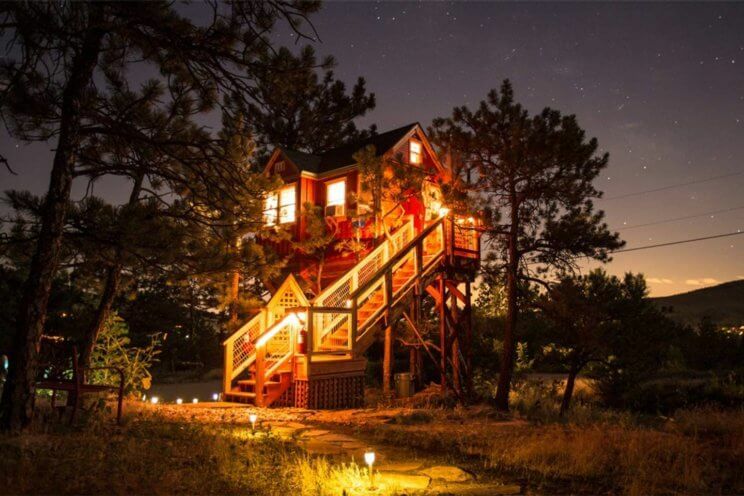 Little Red Tree House is straight up magical. It is built like a tiny house with economy for movement and space, but each nook and cranny is filled with craftsmanship and love. It fits a couple with ease and has a loft bed for an adventurous third wheel or child (same difference). It is within walking distance to lovely downtown Lyons and Planet Bluegrass – an awesome venue that produces some of the best music festivals CO has to offer. TreeHouse at the Highland Haven is a fairy tale from the moment you step through the inviting green door. There are all the luxuries provided with jacuzzi, plush robes, steam shower, and a king bed. Breakfast is included in the room rate (rumor is it involved pancakes!) and the tree house is in walking distance to Evergreen for other dining and shopping. If you are planning a trip to south-west Colorado than visit the Pass Creek Yurt. This yurt fits six people and has space for camping if you can’t fit every one in. With solar lights and solar shower there are a lot of comforts from home, and it boasts a “clean outhouse with a view”, which is probably more than I can say for my bathroom. Leadville Backcountry features two named yurts (most yurts worth their salt are named, I suppose). To get to the huts you will need to hike, ski or 4×4 in and is well worth the effort. Both Emma and Marceline sleep five people and are stocked with fire wood, a propane cooking stove and light, cooking utensils and dishes. You can get cell service if climb a ridge near the yurts and Marceline is wheelchair accessible. NeverSummerNordic has seven yurts and and two cabins for rent in the northern Colorado State Forest State Park. The yurts aren cabin’s provide a range of opportunities for all ages and skill levels of adventurers. Some of them are wheelchair accessible while other have “hike-in” options. All of the yurts come sans electricity and running water, but there are outhouses at each location! The staff is known for being friendly and willing to give suggestions about hiking around the area. Tennessee Pass offers a little more luxury in yurt visits. They provide linens and comforters and are stocked with complimentary coffee, hot chocolate and cider. Luggage can be delivered and you can order a catered meal so you don’t have to lift a finger. Green Sky Yurt Retreat – two person romanic getaway, bathroom and bath, stove and perfect views @ $120 a night! 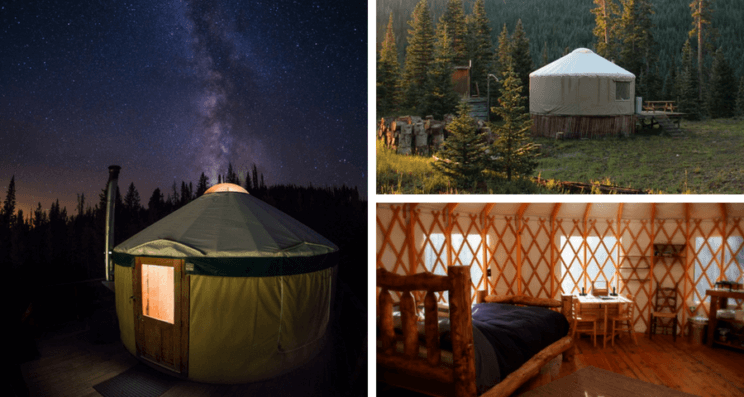 Kurts Yurt – a name that rhymes with four beds and nestled in the headwaters of Four Mile Creek at the epicenter of some of Colorado’s best outdoor options @ $160 a night! Yurt near Camels – Two beds, water and an outhouse on a working camel farm! Meet the camels and try some camel milk products like camel milk fudge. It may be a normal yurt, but it is a completely unique location! $110 a night! The Tipi Village in Granby CO has four tipis and quite a bit of comfort. The beds have their own linens and there is a proper bathroom and hot showers a short stroll away. The fire pit in the middle of the four tipis is the community spot to cook food, warm up and roast marshmallows. This getaway has a private pond onside, free canoe rides and of course many hiking trails to enjoy. If you have everything but the tipi than spend a few nights in a tipi on a working horse ranch only 35 minutes out of Denver. You will need to bring your cots, blankets and bags, food and what ever else you want to make your stay comfortable. No need to hike into this location, you can park right next to the tipi. Its right next to lovely creek when the days are hot and has a fire pit for cooler nights. Psst… this rental is pet friendly, so bring the dog or your two cats on a leash – they won’t judge! The tipis between Gunnison and Blue Mesa Lake have a few more creature comforts and fit up to 8 people. They have cozy beds made up for guests and electricity for those who need to recharge their drone for the next day. For the children there is a small playground, for those needing to relax there is a hot tub. A communal fire pits and a reasonable price tag make this a great retreat! Psst…. looking for fancy cabins and other glamping options? Check out the 12 Best Glamping Vacations in Colorado!